2016 has kicked off with great launches and in one particular segment the heat is on – the 5.5″ mid-ranger segment is set on fire with Lenovo who started the war with the launch of K4 Note as the year started. Following it up was a new entrant LeEco who broke the records selling 2 lac phones in a month with their Le 1S. 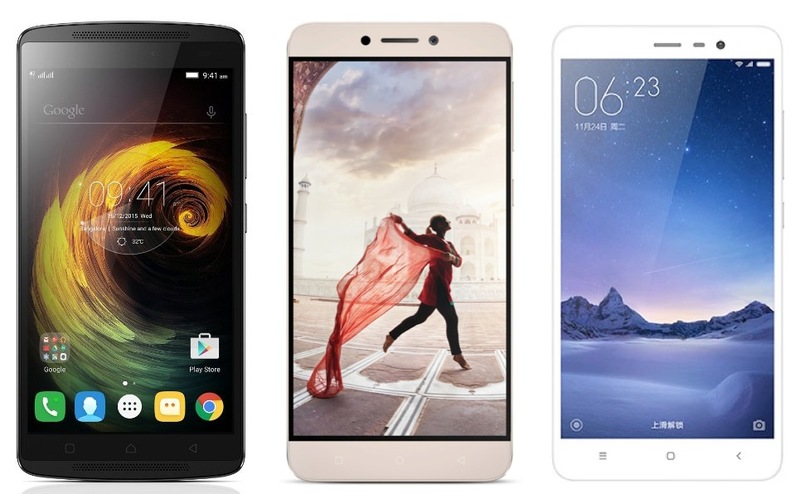 Latest in the game is the Redmi Note 3 from Xiaomi who look to sweep off the others. There was also the Honor 5X that was launched which is also a good option. Now there will be one question on everyone’s mind or the confusion there of – which one of these should you get? The pricing is just 1-2K INR apart. While we have got our hands on Lenovo K4 Note and Le 1s, we are yet to play with the Redmi Note 3. We will make a spec-sheet comparison and give our initial thoughts here. We have intentionally excluded the Honor 5x as they did not launch the 3GB variant in India. Alright, now all the three seem to be killer deals but there is something good in each of the phones and it all boils down to one’s preferences. The K4 Note has been very good when it comes to battery life and camera but on the overall performances there have been issues, just the way we’ve seen on the K3 Note, especially on the gaming front. But when it comes to multimedia the K4 Note excels and caters to the audiophiles. The Le 1s has an awesome unibody metallic build and is the cheapest of the lot. Getting it is easy on open sales on Flipkart. K4 Note too is on open sales now. The EUI has some issues and LeEco has promised an update but overall the phone is a solid performer. What remains to be seen is their post sales service. Last to enter the game but bringing the best processor into the game in the form of SD 650 is Xiaomi’s Redmi Note 3. Looking at the architecture the Redmi Note 3 should be an awesome performer and if you were to get the 3GB RAM variant then there is no looking back. Coming with a full metallic build and things like backlit capacitive buttons and IR blaster, and the feature rich MIUI 7, the Redmi Note 3 looks to win the war especially with the elongated battery life it will provide with the 4050 mAh battery. Few things considered including the pricing, Xiaomi’s Redmi Note 3 looks be having an edge with its processor. What remains to be seen is how well it takes on the K4 Note’s reputation of a good camera. All the phones seem to hold a well working fingerprint scanner. The Note 3 will also support VR headset just like the K4 having the gyro sensor. But when it comes to battery life, it will clearly be a winner. We will wait to get our hands on the phone and report more but at the moment Redmi Note 3 seems to be going on to become a winner.